Once upon a time, I went to my parent’s house to be “helpful” while they were out of town. Then the story took a turn. It became me trying to survive and keep everyone fed and alive. When you combine three teenagers with two seriously adorable/naughty dogs with one unbelievably active 9 year old… well, they deserve a round of applause. My parents. So how my mom manages to host a birthday lunch and serve such delicious home cooked food (while controlling the aforementioned scenario) is beyond me. But I like to try to be helpful. And I am usually really helpful at partaking in the home cooked food part. This chicken zucchini pasta recipe is one that my mom always makes for family gatherings, and it deserves a round of applause from those who make it and those who cook it. It’s a perfectly kinda fancy low maintenance meal that makes me happy happy happy every time I eat it. Mostly I’m just happy that I don’t have her job because I would probably die. She’s amazing. A quick and easy 5 ingredient recipe for chicken zucchini pasta. 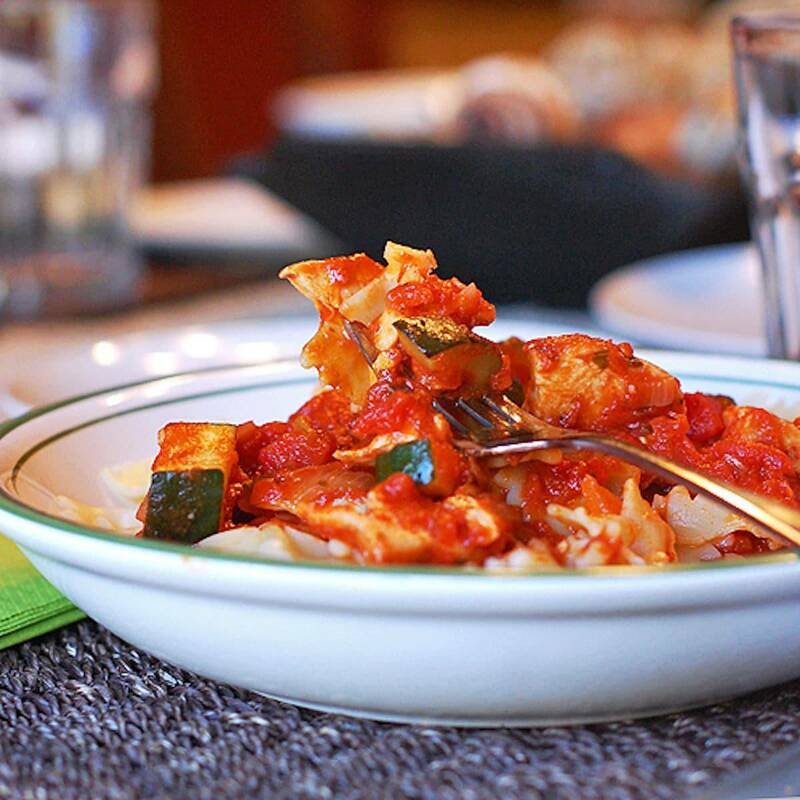 Made with bowties, tomato sauce, sauteed zucchini, shredded chicken, and Parmesan. Heat sauce with zucchini until crisp-tender. Add chicken and heat until warm. Top cooked bowties with warm sauce and parmesan cheese! This easily doubles/triples for large groups, and the sauce can be made ahead and kept warm in the crockpot! And my mom swears by Williams and Sonoma’s tomato sauce. Aren’t mom’s the best? Thanks for doing all the work on this one, Mom! I have an irrational fear of zucchini which I really need to overcome because it does look so good and I think I’m really missing out! This pasta dish is just the kind of thing that I like – delicious and simple! You can do it! And if you really can’t do it… I guess you could substitute some other vegetable? 🙂 But personally I love the zucchini! Yum– this looks like a definite crowd pleaser!! Warm pasta with yummy sauce in the crockpot makes for a very happy crowd. Cheers to your mom! Love this simple yet amazing meal. Simple and amazing is the best combo. Love the simplicity of this meal and I bet it is so satisfying! It is, actually! It’s really nice because I can eat it without feeling overly guilty and it definitely keeps me full. I have enough trouble just keeping track of myself. Good thing there are more organized people (…moms) out there to help! Just five ingredients – and so yummy looking to boot! I love short ingredient lists. Love. i love how simple meals can be so fancy…there’s just something about being easily able to identify every component and its deliciousness!! Mom’s are the best. Great recipe. I wish I had a big bowl of that right now! Me too, considering I just ate a very random dinner. …Mommm? This looks like the perfect ticket to a home cooked fast delicious meal! Great idea! 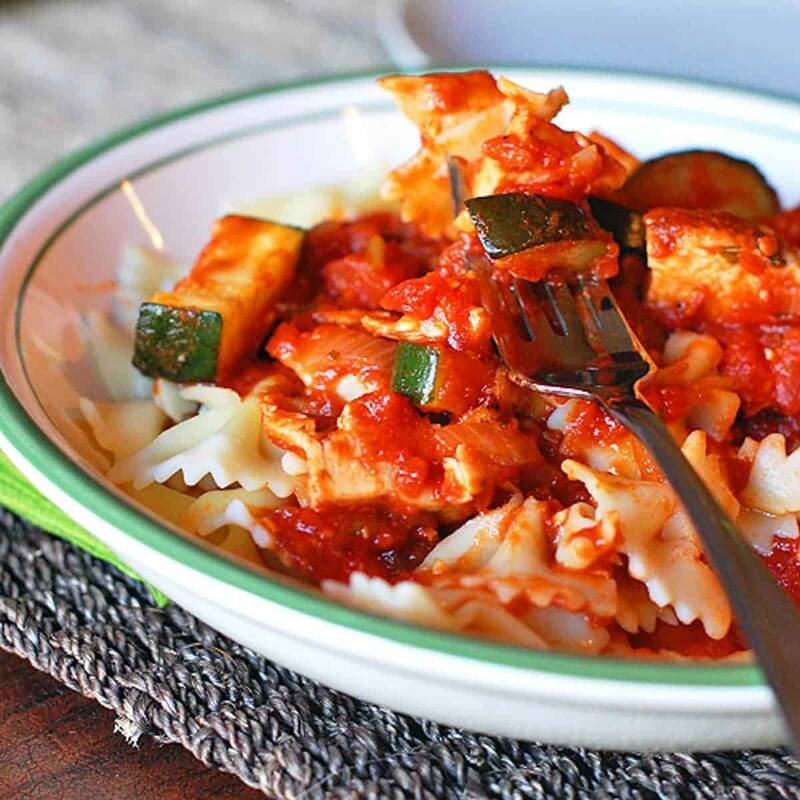 I love pasta with zucchini and tomato sauce! It’s a great combo, and your photo looks gorgeous! Thanks! The photos is easier when the food is so delicious! I made this yesterday for my family, they all loved it! Simple yet delicious, and it looked amaaaaazzing. Definitely will be making this one again. Thanks Lindsay.. and Lindsay’s mum! Aww I’ll have to let her know! Hahaha.. sneaky vegetables are the best! For kids or for husbands… or for myself! What a great idea: simple and so good! The success of this dish depends on the sauce. I didn’t have Williams and Sonoma in my cupboard (didn’t know they made it), and used some other marinara that stands up well to Italian sausage, ground beef and other more flavorful additions. It was pretty boring with roast chicken and zucchini. I will add onions, garlic and some other more zippy ingredients next time. I love the looks and ease of this recipe! Do you sauté the zucchini before adding the sauce? I saw that you wrote “until crisp and tender”. I’m also thinking of adding some chopped Roma tomatoes…what do you think? So glad to find your blog!